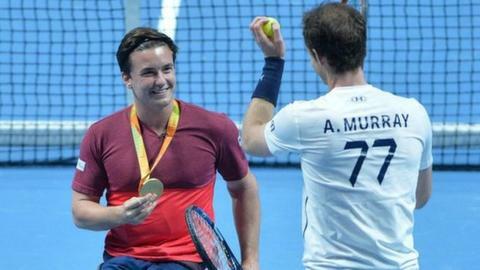 Paralympic gold medallist Gordon Reid welcomes the pressure of being wheelchair tennis's world number one. The 24-year-old Scot achieved the ranking in the same year he won four Grand Slam titles in additions to Paralympic gold and silver. "It's only a good thing if people are expecting you to win because you're playing well," Reid told BBC Scotland. "Hopefully I can keep going in the right trajectory and try to emulate the success of this year." In 2016, Reid won singles titles at the Australian Open and Wimbledon, as well as doubles titles at the French Open and Wimbledon. More recently he added a silver medal alongside Alfie Hewitt in the Paralympic doubles and a gold medal in the singles final - against Hewitt - in Rio. "If someone had told me that at the start of the year I'd have told them they were crazy," said Reid. "It's been a phenomenal year and I've loved every moment of it. The trip to Rio was the icing on the cake and hopefully there will be more years like that in the future. "It's always a really special thing for me to represent my country but to go out there and be on the podium, have the flag on your top and know that you've contributed to the most successful tally we've ever had as a team was brilliant." Despite such a successful last nine months, Glasgow-based Reid believes he has still to reach his peak in tennis. "I'm only 24 and I've already got a lot of experience under my belt, which is really important in our sport," he said. "Physically I still feel like I've got improvements to make and in my game as well there are still things I can make better. "There are a lot of good players at the top of the men's game so it's going to be tough and people are going to be gunning for me. But I'll do my best to try to stay up there." Read more on Paralympic gold medallist Gordon Reid is delighted to clinch top ranking.